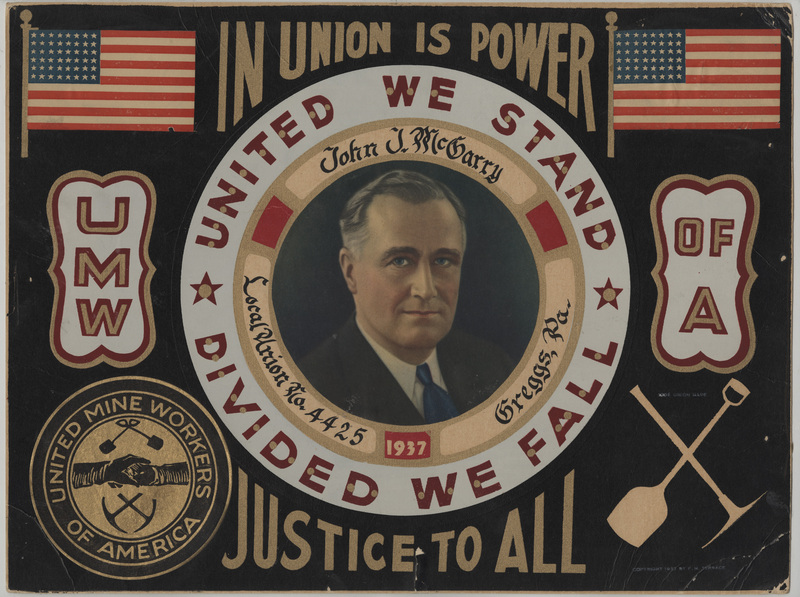 "In Union is Power" poster, Labor graphic arts and poster collection, 1897-1983, Historical Collections and Labor Archives, Special Collections Library, University Libraries, Pennsylvania State University. Founded in Columbus, Ohio in 1890, the United Mine Workers of America (UMW) was an influential member of the American Federation of Labor (AFL) and the driving force behind the creation of the Congress of Industrial Organizations (CIO) in 1937. The union grew rapidly under the CIO. Some materials in the United Mine Workers records may require advance authorization from the curator, Dr. Jim Quigel. Consists primarily of packets and files related to IEB meetings, meeting transcripts, and approximately 10,000 membership restoration cases. Includes correspondence between the head of the United Mine Workers of America and district officers or their representatives in the field, arranged by district. This collection consists mainly of photographs documenting United Mine Workers of America conventions and officials, a photographic survey of American miners’ homes, and labor cartoons. For information on additional collections, enter the phrase "mine workers" in the Special Collections Search box.